by Strachan, Linda, Collins, Sally J.
Strachan, Linda, Collins, Sally J. 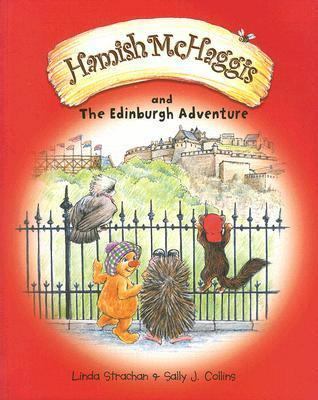 This series of four picture books follows the adventures of Hamish McHaggis and his friends as they visit various destinations throughout Scotland. Hamish McHaggis is a lovable, happy-go-lucky Haggis recognizable by his orange fur, big red nose, and tartan hat. In tow are the skeptical Rupert Harold the Third, a Hedgehog and English gent, the cheeky and mischievous Pine Marten, and Angus and Jeannie, two accident-prone Osprey. Colorfully illustrated, the captivating stories will educate and reveal the geography and history of Scotland and leave children wanting to know more about Scotland. Hamish has tickets for the Tattoo at Edinburgh Castle. But will they make it?Strachan, Linda is the author of 'Edinburgh Adventure - Linda Strachan - Paperback' with ISBN 9780954670177 and ISBN 0954670175.